Named ‘World’s Best Airline’ in the 2018 Skytrax Awards, Singapore Airlines provides superior comfort, a warm and friendly service, fantastic entertainment and delicious in-flight meals onboard. And whether you're planning to soak up the laid-back city lifestyle in Adelaide, sip wine in the Barossa Valley, or search for wildlife on Kangaroo Island, there's no better airlines to start your Journey to South Australia with. So what are you waiting for? Start your South Australia holiday with Singapore Airlines now. Chat to a Flight Centre Travel Expert in-store or call 0800 587 0058 to book today. 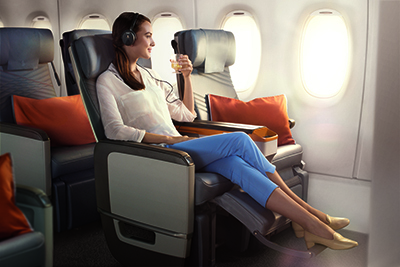 You’ll feel right at home with Singapore Airlines’ award-winning service. Ergonomically designed backrests, adjustable footrests with three separate positions and the perfect neck support, you’ll get to your destination in great comfort. If you have specific dietary requirements, order a special meal to suit your needs. Entertainment: An 11-inch HD touch-screen monitor with an enhanced KrisWorld entertainment system works together with the SingaporeAir mobile app, and saves your playlists and preferences for your flights, so you can easily pick up right where you left off. And with a power outlet and a USB port at your seat, you’ll always be charged. Food and Beverage: Generous meals and refreshments. 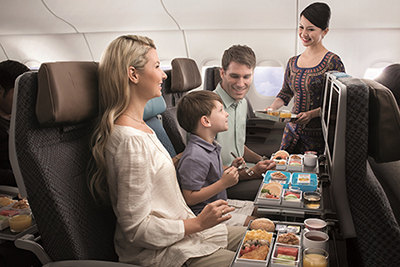 In-flight menus are distributed before take-off and economy passengers can choose between Asian and Western dishes. Regional favourites are often featured on the menu according to the flight’s origin and destination points. The meal service is complimentary, as is the full bar and beverage service. Light snacks are also served between meals on long-haul international flights. A little more goes a long way when it comes to elevating your flight experience. 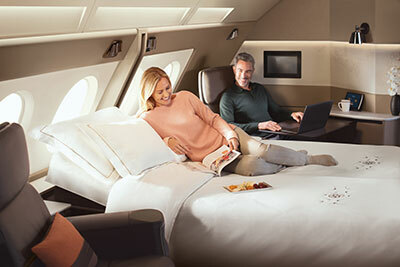 In Singapore Airlines Premium Economy cabin, a glass of Champagne welcomes you, while greater legroom to stretch your legs and additional menu options leave you spoilt for choice. Exclusive, spacious and in a 2-4-2 formation, the Premium Economy seats are designed with a greater width of up to 19.5 inches and an eight-inch recline for enhanced comfort. You can experience Premium Economy when flying to more than 10 destinations globally. Entertainment: The Premium Economy service offers entertainment on a 13.3-inch touch-screen monitor with noise-cancelling headphones. Food and Beverage: Premium Economy passengers have the option of Singapore Airlines' sought-after ‘Book the Cook’ service, where you can pre-order your in-flight meal in advance, as well as enjoy Champagne from the drinks menu. Each Business Class seat reclines directly into a bed, giving you the flexibility to adjust your surrounding seat environment. At nap time, a plush blanket and pillow make falling asleep effortless. If you’re travelling with a special someone, the centre seat divider even lowers to form a double bed (on the new A380 only). Entertainment: Enjoy over 1,000 entertainment options on an 18-inch touch-screen monitor in high definition, paired with noise-cancelling headphones. Food and Beverage: Personalise dinnertime with the Book the Cook meal options, served on the finest porcelain from Narumi, and paired with Champagne and wines from the finest vineyards from around the world. 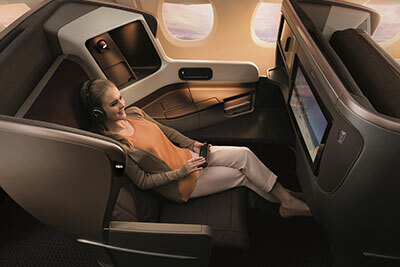 Read our blog on what it's like to fly Business Class with Singapore Airlines. Available on Boeing 777-300ER from London Heathrow, privacy and exclusivity greets from the moment you come onboard into First Class. Your personal space is crafted with the ultimate comfort in mind, so all you have to do is decide how you wish to indulge yourself. Relax in a luxurious seat – 35 inches wide, upholstered in the finest leather with distinctive diamond stitching and extravagantly padded cushions. When it’s time for a rest, curl up or stretch out on your bed and wrap yourself in a soft, lavish duvet. Entertainment: Like anything in First Class, the entertainment on offer is extraordinary. Large 24-inch LCD screens are featured at each seat while superior sound comes from state-of-the-art surround sound, noise-cancelling headsets. The KrisWorld entertainment system offers over 1,000 entertainment options. Food and Beverage: Pre-order you meal with ‘Book the Cook’ options from the extensive First Class menu and have the gourmet selections served at a time of your choosing. Each dish is specially prepared with the finest ingredients and served at your own exquisitely-set table. Warm tones of cream and brown welcome you as you enter your Suite, while leather and wood accents exude quiet luxury and class. Lounge on a standalone bed or recline on your seat. Extra-soft bedding ensures you’ll be well rested throughout your flight. Feel more at home with a sleeper suit, slippers and an amenity kit from Lalique. Selected adjoining Suites can be converted into a space for two – perfect for those travelling in pairs. For more details, talk to your Travel Expert. Entertainment: Entertainment in the new Suites feature a 32-inch full HD monitor that can swivel for the different viewing angles in seat and bed modes, a full-sized personal wardrobe, customised handbag stowage compartment, amenity box lined with soft leather, specially designed carpet and a feature wall with mood lighting - all exquisitely crafted to give a touch of luxury and intimacy. 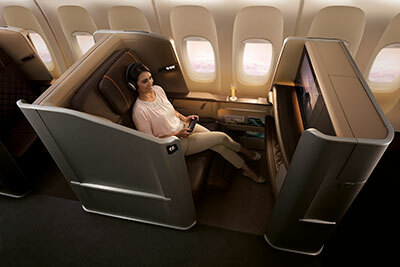 Entertainment will vary untill the new Suites are rolled out across the Singapore Airlines fleet. Food and Beverage: Savour a sumptuous meal from the exceptional in-flight menu which is served on bone china tableware from Wedgwood at your personal dining table. Economy class passengers are allowed 1 piece of carry-on luggage no greater than 7kg in weight. Passengers flying Business, First and Suite classes are allowed 2 carry-on bags, each with a maximum weight of 7kg. Items allowed over and above this allowance are a ladies handbag, laptop or camera bag, and a coat, walking stick and umbrella. Always pack medication, car and house keys, money and jewellery in your carry-on bag. Singapore Airlines uses the piece system for flights to the U.S. and Brazil and the weight system for all other destinations. Flights to and from the United Kingdom go by the weight system. The amount of weight allowed depends on the class flown and frequent flyer status. KrisFlyer Elite Gold and Star Alliance Gold frequent flyers are allowed an additional 20kg while Singapore PPS Club members are allowed double the standard allowance. In many countries no one bag can weigh more than 32kg by itself. This is for work-place health and safety reasons. Sporting equipment and pets are included in the standard weight allowance. Oversized musical instruments such as guitars and cellos can only be carried on board when travelling in economy class and when a separate seat has been purchased for the instrument. Some bulky items must be pre-booked or pre-approved before flying. Always check with your airline before the day of departure for any special procedures. A small infant bag with food or formula and diapers or nappies is allowed in addition to a passenger’s carry-on bag. Infants are also allowed 10kg of checked luggage while collapsible prams or strollers are checked free of charge. Not all airlines provide diapers or nappies. Be sure to have an ample supply for the flight and in case of delay. Some articles such as guns, knives, handcuffs and certain sporting equipment may be allowed in checked buggage but are restricted. Be sure to call your airline in advance for carriage procedures and approval. Always declare items in question to check-in staff at the airport. Check with your airline for specific information on dangerous goods. Check in quickly and easily on the Singapore Airlines website; all you need is your reservation number. Boarding passes can be printed in advance up to 48 hours before flight departure. Even when not checking bags, passengers must proceed to the check-in counter at the airport for passport and travel documentation checks. Depending on your departure point, most airport check-in counters for Singapore Airlines open between 2 and 4 hours before departure. Most check-in points close 40 minutes before departure with Sao Paulo, Copenhagen and Beijing closing one hour prior. Singapore Airlines maintains several lounges for various frequent flyer status levels and cabin classes, as outlined below. SilverKris Lounges – For passengers travelling in Suite, First or Business class and for PPS Club members travelling on Singapore Airlines flights. 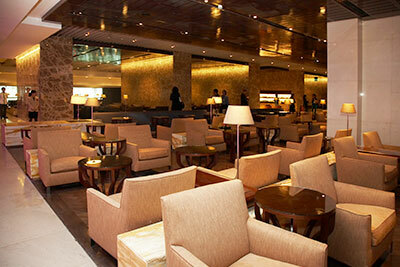 You can find a SilverKris Lounge at London Heathrow in Terminal 2. KrisFlyer Gold Lounges – Located at Singapore’s Changi Airport, the KrisFlyer Gold Lounge is open to KrisFlyer Elite Gold members and alliance partner elite members travelling in Economy class. Star Alliance and affiliated airline partner lounges – Enjoy thousands of lounges around the world such as the Escape Lounge at Manchester Airport and the Virgin Clubhouse at John F. Kennedy Airport in New York. These lounges are open to elite frequent flyer members. See the airline for more details. Singapore Airlines maintains a frequent flyer program called KrisFlyer. Points can be earned and redeemed on Singapore Airlines, Silk Air, Star Alliance airlines and over 100 other airline and travel related partners. There are three KrisFlyer tiers: KrisFlyer, KrisFlyer Elite Silver and KrisFlyer Elite Gold. Each tier enjoys valuable promotions and, with elite status, greater levels of recognition. Singapore Airlines now gives you the opportunity to use your KrisFlyer miles to pay for all or part of your airfare when flying on Singapore Airlines or SilkAir. This now gives greater flexibility for when you book your tickets. Earn KrisFlyer miles on your online purchases, in the comfort of your home or while on the move. Shop on KrisFlyer Spree and choose from over 2,000 leading global and local online shops, plus enjoy exclusive promotions from your favourite brands too. The PPS Club is exclusively for Singapore Airlines' most valuable members. It is a world of prestige and luxury, with a greater level of preferential treatment and special attention designed to make your travel experience more comfortable and convenient. PPS Club membership will be yours when you accrue a PPS Value of S$25,000 within a period of 12 consecutive months.